Canon register a new compact camera today, the code name of the camera PC 2357. The camera first surfaced at Indonesian wireless certification agency. The camera have wireless module WM 600, which is now found in most of the Canon compact, mirrorless and DSLR cameras. According to the Registration List, Canon have only one compact camera registered at wireless certification Agencies. So we can’t expect any more compacts in few moths, possibly we will G or SX Series compact is next. We have been told in past the Canon G7X Mark III is coming with new 1inch DPAF sensor, 4K video and lot’s of enhanced feature. At the same time Canon G5X Mark II and Canon SX100 HS arrival is also expected in near future. Canon SX70 HS is Dead ? We are waiting for Canon SX60 HS successor for more than two years and no update arrived till now. We are now considering the Canon SX70HS as a dead camera. Canon does have 3 100X optical zoom patent ( patent 1 patent 2 and patent 3) but when they will announce a 100X camera no one knows. Sony HX100V was the last Sony megazoom camera announced on 2011, no successor arrived yet. Sony almost crushed the production of small sensors compact camera and they also killed their megazoom series a while ago, the last megazoom compact camera from Sony was Sony HX400V announced on Feb, 2011. Similarly Canon is also putting its concentration on 1″ sensor based compacts, they also killed Canon G16 successor along with other small sensor based compacts camera. Nikon also announced its DL series compacts but due to some serious issues production is still halted. At the same time Nikon is also giving attention to popular small sensor based Megazoom camera. Nikon Announced Nikon P900 (83X zoom) last year. But now due to the absence of perfect rival Nikon skipped the announcement of Nikon P900 successor. No one present to compete against a year old Nikon P900. Canon may announce a High-End DSLR on NAB Show (April 5 – 10), In general at NAB show Canon announces Cinema EOS related products dedicated for videographers, but there is a strong possibility that we may see Canon 7D Mark II with excellent still and video capturing capability. Canon G17 announcement is expected at End of Aug or at the beginning of Sep 2014 with new sensor and better zoom lens, …. a major upgrade in the G17 core specification. And finally, Canon is also rumored to announce 2 cinema lens for its Cinema EOS line-up at NAB show. The rumors are coming from different sources and are of low-credibility, so take them as grain of salt. 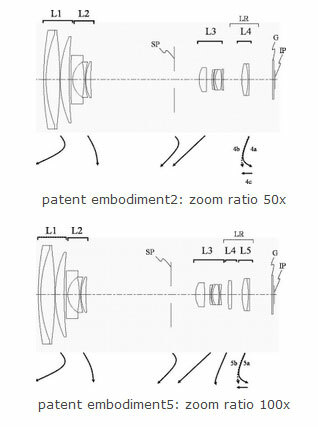 A new patent surfaced over the web that shows a compact zoom lens with 100X optical zoom, the focal range of 3.6mm to 340mm, aapprox 18mm-1768mm lens for a 1/2.3″ sensor. Canon will sure use a 100X optical zoom in its upcoming megazoom cameras, but it always hard to implement theoretically correct things in practical life… The major area where problem will arise is image stabilization, noise control and retractable lens barrel with ultra-compact design. But we always have high hope from Canon and we wish to see a 100X camera from Canon very soon.